The mission of the African American Theater Consortium (AATC), a fictional organization, is to create a conversation about contemporary racial identity, using the performing arts as a means for social change. Their brand identity is inspired by African textile patterns and uses contemporary colors and an upbeat tone to convey the relevance of their mission and the excitement of theater. View the motion graphic on Vimeo. View the brand story booklet on Issuu. View the logo motion graphic. AATC's website has two main functions: raising awareness about their mission and connecting people to local theaters. View an image of the homepage in full screen. In addition to a main homepage, each city has its own page to feature upcoming performances. 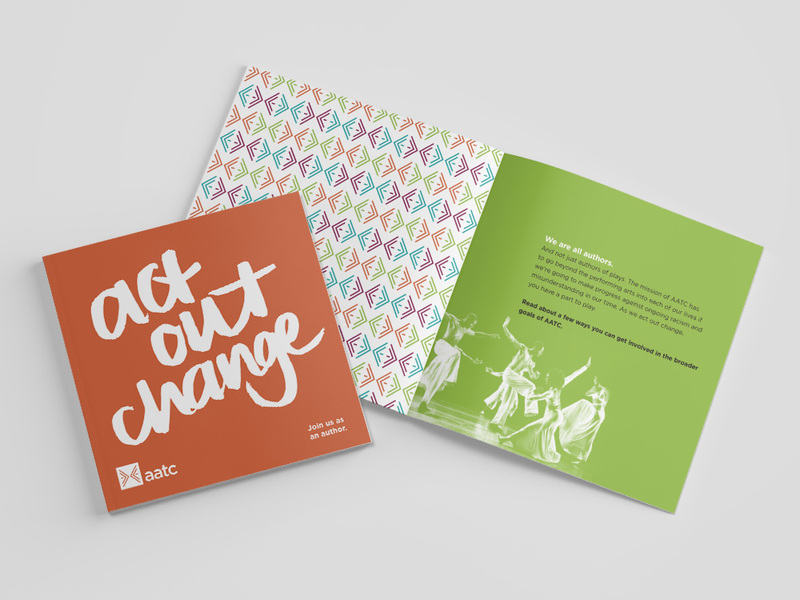 General brochure about ways to get involved in AATC. Schedule of performances for a local theater. View the brand story booklet.